Art Bell: Somewhere in Time returned to June 12, 2001, for an intense debate with Mike Heiser and Grant Jeffrey about the Bible Code. 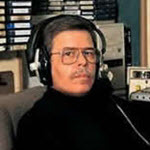 Art Bell – Somewhere in Time returns to June 5, 2001, when Bigfoot researcher Robert Morgan was joined by a man named “Bugs,”, who told his shocking story of shooting two Bigfoot creatures. Art Bell: Somewhere in Time returned to May 11, 1998 when authors Chuck Missler and Mark Eastman discussed the UFO phenomenon from a Christian viewpoint.